When an author describes the unseen worlds with conviction, and makes them tangible, I immediately know I’ve found a great children’s book. In addition to all the action and drama in this wonderful book, I love that the heroine Rowan is part aelfen, and that the spirits come to her when she is most in need of wisdom or help. The book has a wonderfully clever premise — that Robin Hood actually fathered a daughter by an aelfen woman, a wise woman who was a healer and forest dweller. If you love tales of Robin Hood, this is a perfect complement, bringing in the feminine in ways that might be missing in Robin Hood’s tale. Indeed, the whole point of Rowan’s own band is that it will operate in a more feminine way than Robin Hood’s band, not by putting his down, but as a beautiful counterpoint. I loved everything about this book… the writing, the memorable characters, the premise, the aelfen, the wisdom of herbs, the forests, the challenges. It’s just a terrific children’s book. Because it hints at the violence against women by the knights, I would not recommend it for girls under 11. I discovered this children’s book was the first of a series of four, and immediately read what I thought was the next, which turned out to be the last. I’ll review that another day. 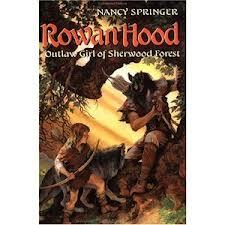 Meanwhile, here’s to Robin Hood and his courageous daughter Rowan Hood!